As always, the Allen Institute for Artificial Intelligence are on the case to push AI for the common good and in the process to push machine intelligence further along. Their latest headline-maker is the online game they devised, a kinda sorta Pictionary-type puzzle, with two modes of easy and hard. The game pairs a human with an AI program. The AI bot is called AllenAI. The distinguishing feature of this draw-and-guess game is that your AI agent partner is just that, a partner—not a foe. AI2 research scientist Aniruddha Kembhavi pointed out that in many computer games, the agents are adversarial with human challengers in nature; that is not the case here. The role resonates with the group's overall purpose to explore and use AI for the common good. Basically, you draw an image and the partner has to try guessing what it is. Translated into a brain workout: the requirement is to convey concepts. Not just children, for example, but the challenge might be to guess at children singing. This is an online version of the game, and it is dubbed Iconary. In Iconary, you team up with the AllenAI artificial intelligence to either draw or guess a set of unique phrases. Do you want to play? There is a link that takes you to your play spot where you can try it out. You can either step into "draw" or "guess" mode. In other words, human players can either choose to draw an image or guess a picture that the AllenAI has drawn. "Iconary is the one of the first times an AI system is paired in a collaborative game with a human player instead of antagonistically working against them." The program does not give up if only part of the phrase is correct; it asks for another image for clarification. Will Knight in MIT Technology Review gave readers an example of how the game works. "Given the phrase 'turning a page,' for instance, a player could try drawing a book, a hand, and a curved arrow. In that particular case, the AllenAI program guesses correctly after just a couple of tries." The crew behind the game have a motive for putting this game out there. It's their opportunity to learn. The MIT Technology Review said that in such a guessing game involving the phrases behind drawings, the machines will gain some understanding of the way concepts fit together in the real world. AI has answers but where is the common sense? You may have heard this admission before, as it has been said that teaching artificial intelligence, just plain common sense has not been easy. Over time, AllenAI should learn from their common-sense understanding of how concepts such as books and pages pair up in everyday life. Plus, it will help researchers explore ways for humans and machines to collaborate effectively. "Games have been a successful platform for testing AI," computer scientist and researcher Ali Fahadi said in MIT Technology Review, "but intelligence is more than pattern matching." While collaborating with human beings, at the same time the machine is learning about how humans think. Anthony Cuthbertson, The Independent, quoted Aniruddha Kembhavi, computer scientist. "This is a first step toward exploiting common sense," he said. Technologies at play in the game? With computer vision, the artist's sketches are turned into clip-art icons; going to work on the correct answer, a database of words and concepts and the relationship between them swing into action. But, hold on. This is not Pictionary with just a different name. Katyanna Quach in The Register picked out the difference between the popular game and the AI2 online teaser. 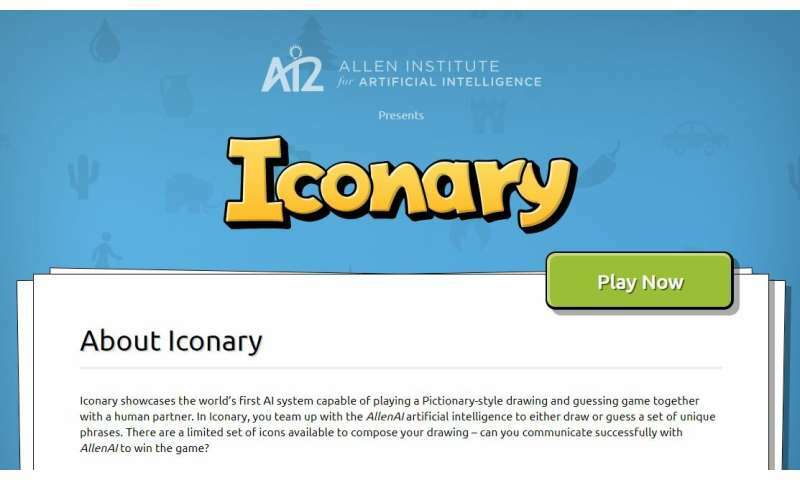 "Unlike a real game of Pictionary, in Iconary you draw each section of the scene at a time, and each section is analyzed before moving on to the next part." She walked readers through a scenario involving the phrase, "catching a ball." She said, " first you draw a person with their arm out. The software makes a few suggestions from your sketch, and hopefully 'woman with arm out' or 'man with arm out' is listed. The player chooses one and places the icon on the screen. On to the ball. "The software should suggest a ball out of list of other round objects. Place that icon as well near the outstretched hand. Then AllenAI guesses something like 'throwing a ball' then 'catching a ball,' and the game's complete." The team said the data behind Iconary will be made available later this year. So will information about the model. Moving forward, the team is even thinking of a large scale Visual Turing Test, said The Register. They would have the AllenAI play with a large and diverse set of people. Quach quoted Kembhavi. "This would entail people being paired either with AllenAI or with another person, and at the end of the game, they would be required to guess if their partner was a human being or AllenAI." With artificial intelligence having beaten humans in board games, what's next?